Pretzel rocking his PCT gear set up on a practice hike up Blood Mountain. Pretzel hails from Illinois. 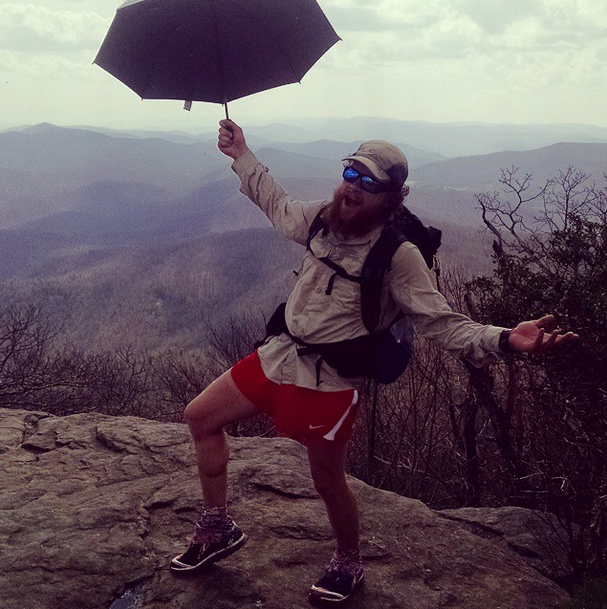 After getting a degree in Outdoor Recreation, he thru hiked the Appalachian Trail in 2012. The AT lead to a thru hike of the Long Trail in 2013 and then the Colorado Trail in 2014. Three years after his first thru hike, he accidentally has about 3,000 trail miles under his belt. Now, he is setting off for another long haul! Pretzel has only been with us here at Mountain Crossings since the end of February but even in that short amount of time, he has proven to be an irreplaceable member of the team. Unfortunately, we are loosing Pretzel to the PCT for a couple of months. We are super stoked to send him off into the wonderful, wild west, but we will miss him a ton! He has been bringing the heat on gear knowledge and perfecting his double and triple shakedown game throughout this hiker season. Pretzel is an ambassador for several top selling items in the shop here at Mountain Crossings inculding ULA Equipment, Point6 Socks and Superfeet. We hate to see him go but we love to see our friends take off and have fun. Follow Pretzel on his PCT journey through his Instagram account. If you don’t use Instagram, you can still view his photos from the underlined link. If you are an Instagram user, follow @firexneck for excellent shots of the PCT popping up in your own feed! This entry was tagged appalachian Trail, backpacking, Employee, hiking, Matt, mountain crossings, Neel Gap, Pacific Crest Trail, Staff, Thru Hike, thru hiking. Bookmark the permalink.